This is one of the most beautiful novenas that can be said. Most Holy Virgin, who has deigned to come to Fatima to reveal to the three little shepherds the treasures of graces hidden in the recitation of the Rosary, inspire our hearts with a sincere love of this devotion, so that by meditating on the mysteries of our redemption that are recalled in it, we may gather the fruits and obtain the conversion of sinners, the conversion of Russia, and this favor that I so earnestly seek, (mention your request) which I ask of you in this novena, for the greater glory of God, for your own honor, and for the good of all people. Amen. By your pure and Immaculate Conception, O Mary, obtain the conversion of Russia, Spain, Portugal, Europe and the whole world! Sweet Heart of Mary, be the salvation of Russia, Spain, Portugal, Europe and the whole world. Lucia said that Mary called for a series of devotions, including the Five Saturdays, frequent recitation of the Rosary, and prayers for the conversion of Russia – at the time viewed by the Church as a godless, Communist nation. Our Lady of Fatima, Pray for our beloved country. 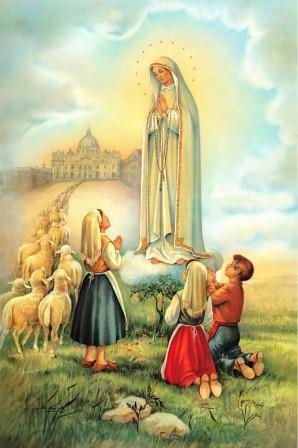 Our Lady of Fatima, Help those who invoke thine aid. 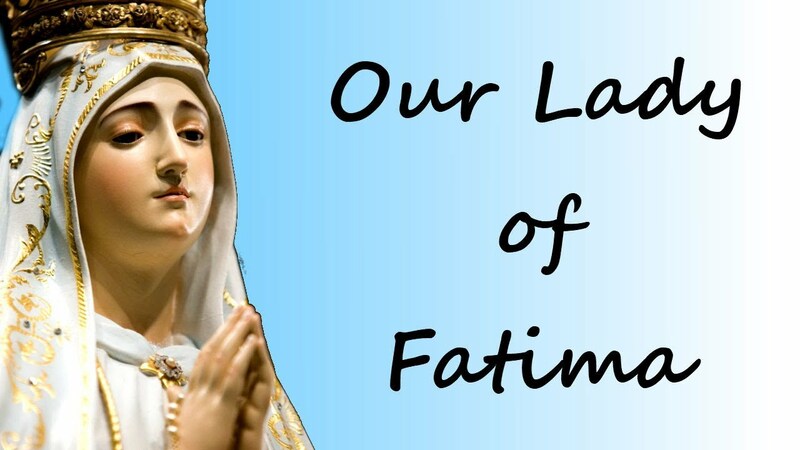 Our Lady of Fatima, Bring to Holy Catholic Church those who are in error. Let Us Pray: O God of infinite goodness and mercy, fill our hearts with a great confidence in Thy dear Mother, whom we invoke under the title of Our Lady of the Rosary and Our Lady of Fatima, and grant us by her powerful intercession all the graces, spiritual and temporal, which we need. Through Christ Our Lord. Amen. On February 15, 1926 the Child Jesus alone came to visit Sr. Lucia and asked if the devotion to the Immaculate Heart of Mary was being propagated. Sr. Lucia spoke of a difficulty some people have in confessing on the first Saturday, and asked if they might be allowed eight days in order to fulfill Our Lady's requests. Jesus answered: "Yes, even more time still, as long as they receive Me in the state of grace and have the intention of making reparation to the Immaculate Heart of Mary." Five decades of the Rosary may be recited at any time or place; yet, since one will be attending Mass in order to receive Holy Communion, a very desirable time and place would be before or after Mass in the presence of the Blessed Sacrament. Meditation on the mysteries according to one's capacity is an essential condition for praying the Rosary. Yet, involuntary distractions do not rob the Rosary of fruit if one is doing the best he can. "Keep me company for fifteen minutes while meditating on the mysteries of the Rosary." The question is often asked: Does the meditation while reciting the Rosary fulfill this condition, or is there required an additional fifteen minutes of meditation? That an additional 15 minutes of meditation is required was recently confirmed by Sr. Lucia of Fatima. It is clear too from a statement by the first Bishop of Fatima.